It's hot off the digital press. 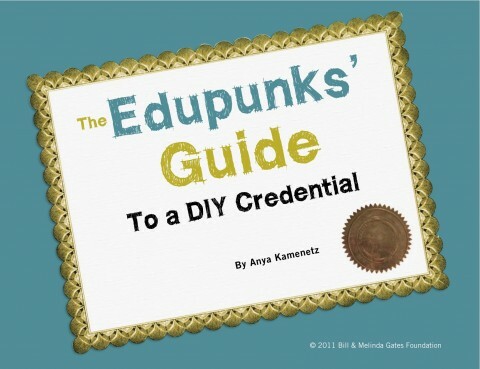 Anya Kamenetz, a senior writer at Fast Company Magazine and author of DIY U: Edupunks, Edupreneurs, and the Coming Transformation of Higher Education, has teamed up with the Gates Foundation to release a free ebook, The Edupunks' Guide to a DIY Credential. The new ebook offers a "comprehensive guide to learning online and charting a personalized path to an affordable credential," and it comes complete with some handy-sounding tutorials: how to write a personal learning plan, how to teach yourself online, how to build your personal learning network, 7 ways to get college credit without taking a college course, etc. The book also smartly features a long list of open educational resources, where the author was nice enough to give us a small mention. You can read The Edupunks' Guide to a DIY Credential on Scribd, or alternatively you can download it in multiple formats (PDF, Kindle, ePub, RTF, etc.) at the bottom of this page. Por favor, desejo receber todas as informações a respeito deste livro e poder fazer o curso on line.